← Hey Man, how about this alternative? March 2015 Paper Pumpkin kit was awesome! If you created the cards as suggested you had 9 darling cards for either “Hello You”, “Thank You”, “Happy Birthday to You” or even an invitation! But by now you know I can’t quite leave it alone and just do the suggested version! Again, back to Pinterest for ideas and saw lots using bold colors (my favorites!) to add a spark to the already fantastic cards. 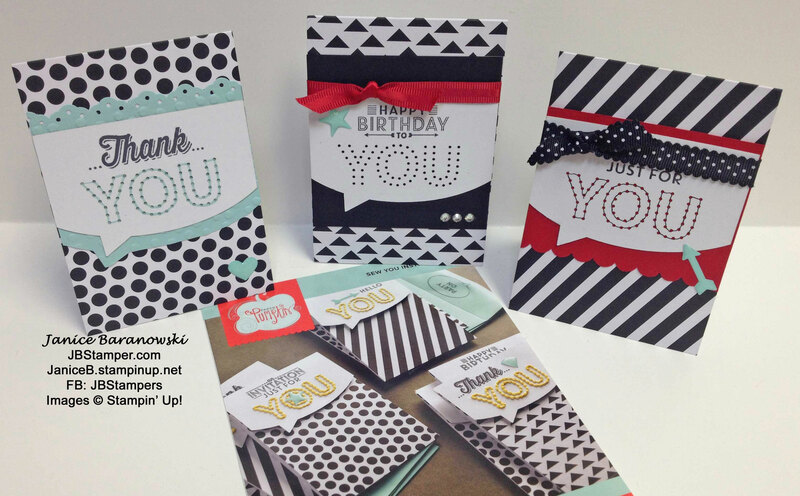 I love the look of the Black & White cards with a touch of Real Red – elegant and sassy! After looking at lots of variations I decided that Amy Whelan’s versions were just what I was looking for. I varied mine slightly but loved the inspiration she provided me for these cards! Thanks Amy. I decided not to use the “sewing” on the ‘YOU”. Do you remember those cards we had as kids and that you could sew around the designs with yarn? Or did I just date myself again? This entry was posted in Birthday cards, Invitations, Paper Pumpkin, Thank You cards, Thinking of You cards and tagged Birthday, Black & White, Paper Pumpkin, Paper pumpkin alternative, Stampin' Up!, Thank you, thinking of you. Bookmark the permalink.